Any student of engraving will quickly find that they absolutely must become familiar with point geometry and be able to fashion their own gravers to suit their needs. This applies even to the most elementary exploration as it is nearly impossible to find ready-made tools except for some fairly sophisticated ones. It may appear, when looking at the plethora of information available on the web, that one needs a vast array of gravers or chisels to get anywhere, or that one needs expensive, precision, power driven hones and jigs to produce a functional graver or chisel. Neither of these is true, especially for a simple exploration of line engraving, to see if it appeals to you. The most important and necessary component to have is, as mentioned above, a working knowledge of tool geometry to produce the tool of your needs. Form, indeed, follows function. After some years of using the Crocker I visited Leonard Francolini, Colt engraver extraordinaire, who shared with me his style of point geometry which I found instantly appealing. Below are photos of how to go about getting it. I use this shape, with variations, for about 80% of my engraving line work, using it in palm-push tools, with a hammer and with the Airgraver, as needs be. It is a fundamentally different geometry than the faceted points obtained by the use of jigs and fixtures. I found that I could form this type of tool by eye without the use of any jig. Almost any kind of grinder from a bench grinder to a rotary shaft could be used to form the point. Stones to polish the edge. Of course, as time goes on, you add a variety of specialty chisels depending on your needs, but so much can be done with the simplest of tools. Also, I don't want to imply that I have anything against the use of power hones, jigs etc., but I would not want anyone to be discouraged from trying engraving because they thought it was necessary to have them and perhaps could not afford them. In my mind the only difference between a graver and a chisel is size, and this info applies regardless of size and is for a line cutting graver(I'll use the terms interchangeably). 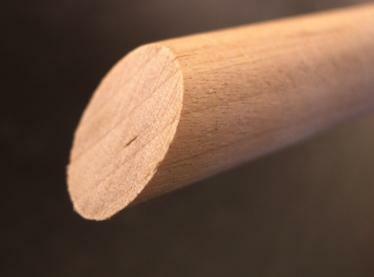 First I'll show how I shape a round rod to make a line graver. Round rod is something easily available to most of us. This point can also be adapted to square stock and tapered tagane. I'm going to show this using a wood dowel as it will photograph easily showing the planes without reflection. This is a general use shape and can be varied, especially the width of the face angle and the sweep of the heel. I do all this shaping without the use of jigs, although I did use them at first and some will find them helpful, I'm sure. Doing most of my engraving in non-ferrous, my gravers stay sharp a long time. This first shot shows the face angled at about 55 degrees(could be 45-60). Please feel free to jump in with any questions. Oh, I'm so glad you are doing this thread. 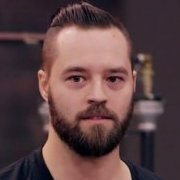 I've been having trouble on this topic and I could use some help. I've read through the other threads but they seem to primarily focus on engraver systems. I can't afford that and really just want to know more about the chisel graver and hammer approach. The tricky part is to how to make the gravers RIGHT which includes heat treat. I will be eagerly following this thread. The next step is to grind the top down to reduce the size of the face and make it a more useful shape. 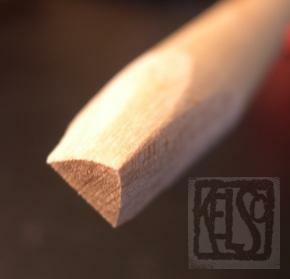 Next the sides are shaped to bring the bottom of the face to a point. This is where you have a lot of discretion, to make the face fit the function. The angle at the point can be very wide(90 degrees or even wider, or quite narrow. It depends on if you want to cut a wide , bold line or a thin shading type line. As always, form follows function. I've chosen to show a fairly narrow face which might be called an onglette. This step takes some care to retain symmetry side to side as you want the line on the bottom(behind the point) to go straight back behind the point, not to one side. The major shaping can be done with whatever grinder you have available, could be a bench grinder or even mizzy wheels on the flex-shaft. I usually only stone the face and wherever else the graver will make contact with the work . I can make a tool very quickly this way without having to spend a lot of time using a jig or stoning. The main thing is to have the geometry correct and a nice finish "where the rubber meets the road". Next I'll show the heel mentioned earlier. In the photo above, you can see that on the bottom of the graver going back from the point is just a straight line. If you use the tool like this, it will be impossible to maneuver as it will tend to just dig in and drag going around corners, and you will have to hold it at a very low angle to the work. 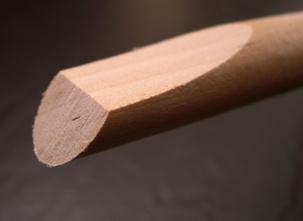 If you look at the photo below you will see a sweeping curve behind the point. The general rule is, the straighter the cut the less curve you need. Going around a tight radius, you need a more exagerated lift. The heel that a lot of engravers use is a more complicated approach really requiring a jig, at least starting out and is more like putting facets on the bottom of the graver. The heel shown here is fairly shallow, for straight lines and moderate curves. Tighter curves would need a more exaggerated curve, giving more lift, decreasing drag around a curve. Thanks Josh. I'm mostly wanting to cover shaping here as heat-treat is dependent on the material used and is so well covered in any number of places. This point is totally versatile and could be used in a palm-push tool, hammer and chisel or pneumatic aided tool. Great stuff Jim. This is exactly what I did, much more trial and error though. Read about angles, try it, adjust accordingly to learn what adjusting what did what haha. Wow, how fortuitous, last night I was looking for engraving books at my local library's web site. Mr. Meek's book, The Art Of Engraving was one of the three on the shelves. I was planning a day trip to see if the books were of use. Now I know that, at least this one, will be. Just to clarify, this tutorial is meant as the most basic entry to engraving to see if it appeals to you. If you become, or are already serious about going further, it's going to take a lot of study and hard work to progress. I would recommend to the serious student to begin with hammer and chisel. Once the geometry of the point shown here is understood it can be adapted to square stock or the ready-made tagane available now, either from Patrick Hastings -Tagane Arts or from Saign Charlestein, or your own forged configuration. Take advantage of the classes available these days. Once you get the basics it's all about time and practice. Just some tips from this side of the pond! I have read John Lee Schippers book called Engraving Historic Firearms from front to back, and for a newbeginner I would recommend this book. I prefer recommending it over Meeks book (which is priceless and excellent). But Mr Schippers made it very easy to understand each part he explains about, using loads of pictures and sketches. Even though english is not my mother tongue I had not problems understanding any part of it. It focuses on hammer and chisel and hand pushed engraving and shortly at the end talks about pneumatic engraving. It also explains simple and cheap ways to do everything yourself. Great tutorial again! Thanks Mr. Kelso! John Schippers is who I learned from in a class in 2001. He made it look easy. The real trick once you learn how to sharpen is, as Jim said, practice. Daily practice. And good magnification. A #5 optivisor is good. Thanks very much Daniel and Alan. I had no idea about that book. It looks like a fantastic resource. Steve Lindsay says it will be a classic. 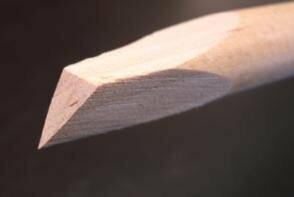 I also forgot about this thread which mentions the Gesswein die-sinkers' chisels, possibly the quickest way to get a chisel in your hands. You will have to put a heel on it as outlined above. This may help a tiny bit if I can get the link to stick. Here are some close pics of the basic Japanese style chisels. I've got the book from the library, now I need tools. But rather then try to forge a set of tools I've never seen, I decided to buy my first set. 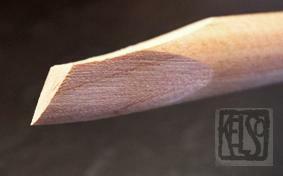 A set of the Gesswein die sinker chisels is on they're way. The other thing that is absolutely essential to satisfying progress is the ability to draw what you want to engrave. If you can't draw it, you will never be able to engrave it. This doesn't mean that you have to rival DaVinci, but if you can't lay down on paper what you're shooting for, it will never happen in the metal. Many of us have the "but I can't draw" syndrome. Nonsense. That's a self-applied limitation. Anyone can draw, except if you believe you can't. Some will progress faster than others, naturally. The key is to start from where you are and improve with baby steps. John Schippers taught us a secret shortcut: trace the design then transfer it to the piece with carbon paper. This is great for script and historical reproductions, and for original designs that are bigger than you want. Scan it, reduce it to the size you want, and transfer. I wholeheartedly agree!! As being one of few to go to art school who "couldn't draw" I'll offer some advice on the subject that my professor told me. Many of us have the "but I can't draw" syndrome. Nonsense. That's a self-applied limitation. Anyone can draw, except if you believe you can't. Some will progress faster than others, naturally. The key is to start from where you are and improve with baby steps. Thanks Guys. Another thing to mention: copying is a very useful tool in the study of engraving. It allows you to deconstruct the elements of a design and then compare your results to the original. When I first started I nearly wore some books out studying scrolls, then Japanese work later. Study the best work you can find. This will help establish a sound base from which you can then improvise.